Legendary Prussian Field Marshal Helmuth von Moltke once noted ‘No plan of operations extends with any certainty beyond the first contact with the main hostile force’. Although he is not waging war in the physical sense, European Central Bank President Mario Draghi should have considered this before he declared victory in 2018 in his struggle to fend off both bears of the euro and recession in the Eurozone. Draghi stopped adding to the ECB’s three-year old quantitative easing (QE) programme in December, as he had said it would last June, when inflation was exactly in line with the central bank’s 2% target, compared to 0.3% when the bond-buying programme began. 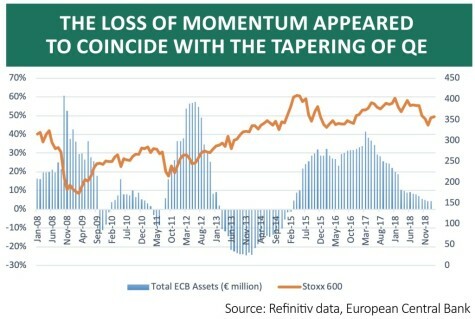 Investors and Draghi may have been tempted to think that the ‘hostile forces’, to use von Moltke’s term, of deflation and currency speculators had been beaten back, especially as Germany’s DAX equity index and the wider Stoxx Europe 600 benchmark were trading at or near all-time highs. Not so fast. As the ECB began to taper its QE scheme during the year, business confidence indicators, inflation, the euro and European stock markets all ebbed. Italy has even slipped into a technical recession with two consecutive quarters of falling GDP. Over the past 12 months, Western Europe outperformed only the Africa/Middle East region of the eight major geographic options available to investors with a 3.1% negative total return in sterling terms. 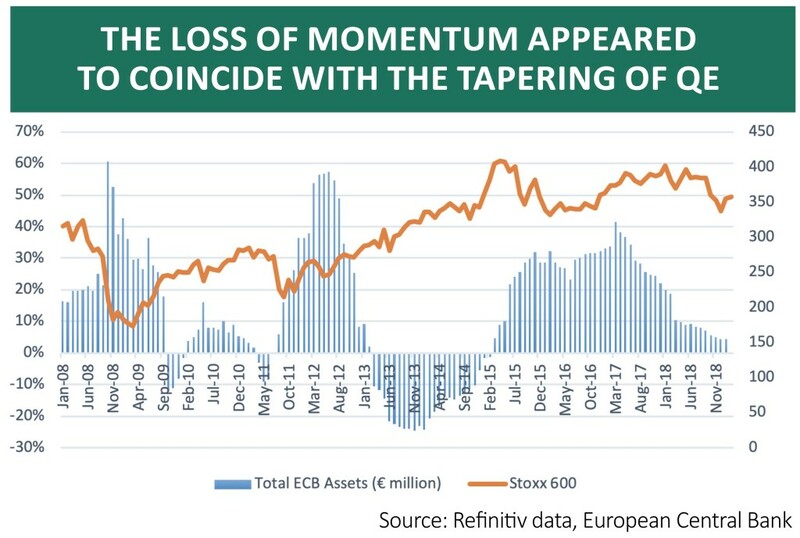 This is because the Stoxx Europe 600 stock index began to lose altitude seemingly as soon as the ECB began to slowly taper its monthly QE scheme down to zero, from a peak of €80bn a month. As a result, Draghi used January’s ECB press conference to announce that the central bank was again ready to use all of its policy tools to combat any economic slowdown in Europe, including a relaunch of QE. Coming just as the US Federal Reserve began to back away from interest rate increases and raise the prospect of halting its moves to withdraw QE, Draghi’s words have given European stocks a lift. But investors must now decide whether this can last, given the underlying fragilities which even a tapering of QE in Europe – let alone any moves to withdraw it – appear to be unveiling and the possible failure of Draghi’s policy to halt QE to meet first contact with its enemies. If one country has benefited from the ECB’s QE largesse it is Germany. Its export-driven economy has made the most of record-low interest rates and a competitive currency. Yet even here the cracks are appearing. Whether this has been caused by stricter anti-pollution testing rules hurting car sales, concerns over global tariffs and trade, Brexit or even a modest tightening of monetary policy in the US and Europe can be debated. 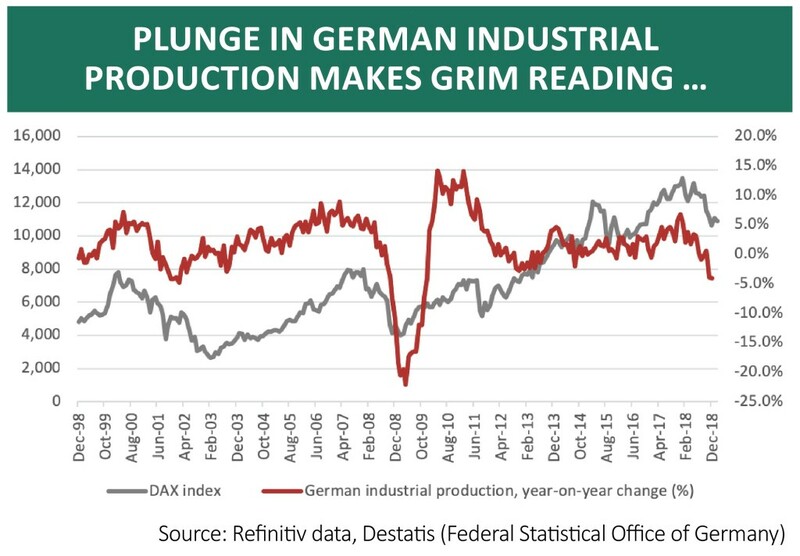 But German industrial production has now dropped year-on-year in four of the past five months. December’s 4% slide was the worst decline since December 2009, right at the end of the recession that came out of the global financial crisis. And where industrial production growth goes, Frankfurt’s DAX equity index seems keen to follow, if history is any guide. 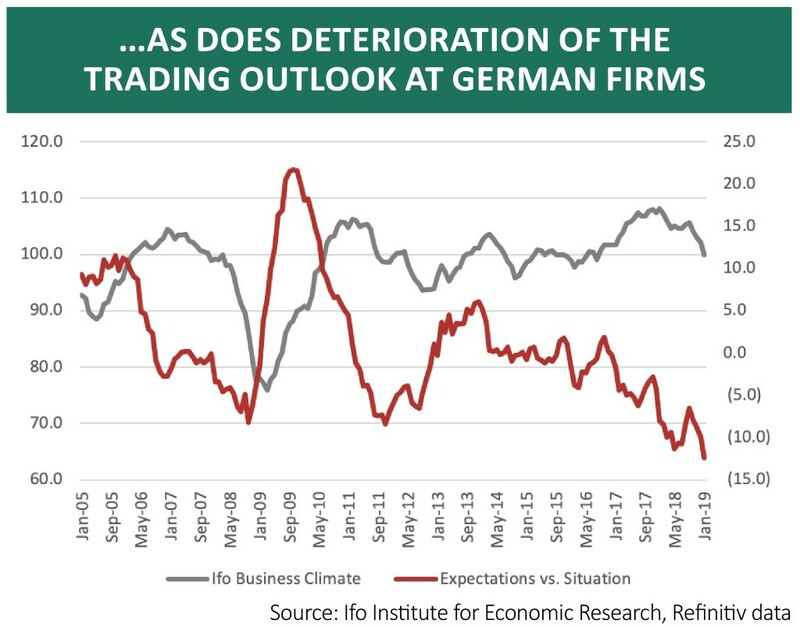 Given such woes, it is hardly surprising that German business confidence is on the wane. The monthly Ifo sentiment indicator is still holding up pretty well at 100 but any sustained drop below that level would not necessarily be a good sign. 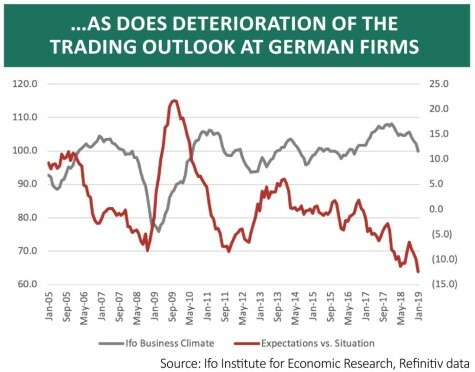 More worryingly still, the gap between German companies’ view of their current trading and expectations for the future continues to widen, with more firms preparing for tougher times ahead. 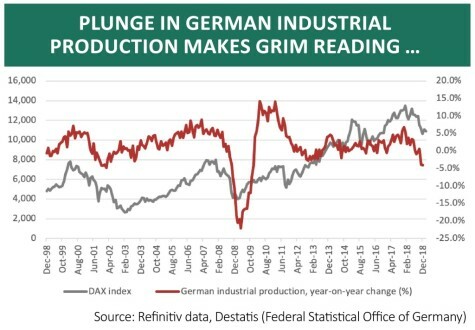 If Germany’s slowdown does turn out to be nothing more than a blip caused by new car emission testing requirements then sentiment – and equity markets – could turn around pretty quickly. 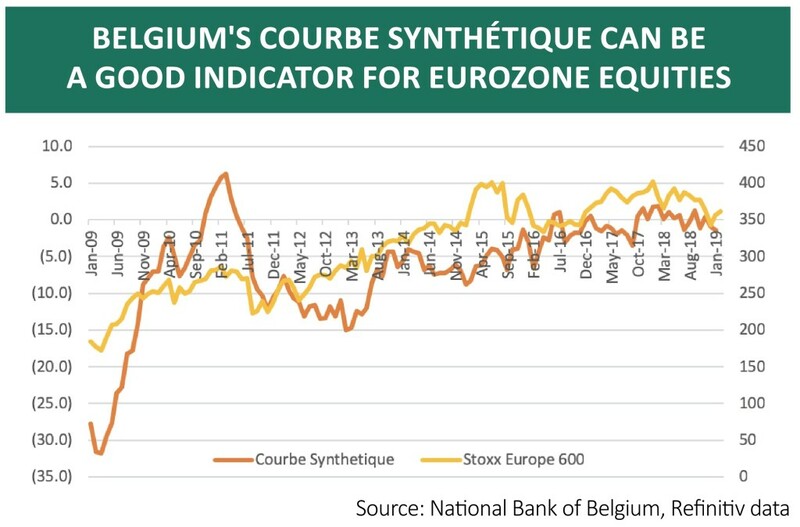 Besides the German headlines and ECB policy machinations, investors with exposure to European assets might also keep an eye on Belgian industrial confidence indicator the Courbe Synthétique index. 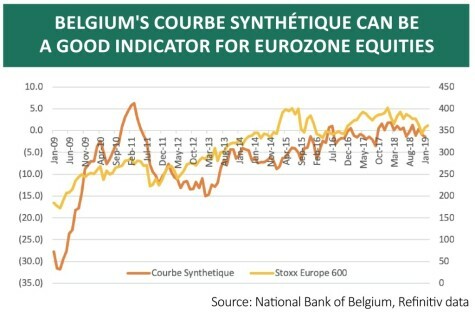 It does seem that the views of 6,000 Belgian industrialists provide a reasonably canny insight into the broader fortunes of Europe’s economy and stock markets. The next survey is scheduled for release on 22 February. Any improvement could give bulls of European stocks a lift, especially as it possible to argue the Stoxx Europe 600 is far from expensive on 12 to 13 times forward earnings for 2019 after its recent bout of underperformance. Equally, bears will growl that the Courbe is no higher now than it was in December 2015, despite the ECB’s efforts to boost and support markets alike. Sceptics may also be reluctant to go overweight on an asset class that appears reliant on its central bank monetary fix, from which it will surely one day need to be weaned.